By Kristi · 10 Comments · · Disclosure: This post may contain affiliate links. Using an affiliate link means, I might earn a commission from any purchases through that affiliate link. Moms wear many different hats. We juggle schedules, we move mountains and we make things happen at any cost! It’s not easy, but we still manage to get through our days with a smile on our faces and happy children running around with laughter and joy in their hearts. I needed breakfast ideas since our lifestyle was changing. I needed a plan to fix lunches easier and dinner had to get on the table earlier than 7pm. It was a necessity! My mom worked outside the home when I was growing up, so she wasn’t able to make breakfast every.single.morning. But I always managed to have homemade breakfast waiting for me. I couldn’t figure out how she did it and I needed to be filled in on her little secret! 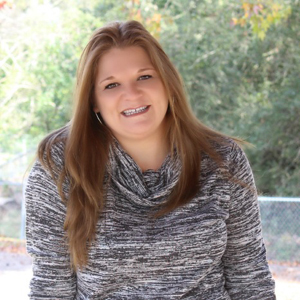 She always seemed so planned, organized, and made it easier on me and my brother…she did it all! It was her job, but the next thing that came from her mouth hit home! A concept so simple, yet I was in the dark about it! 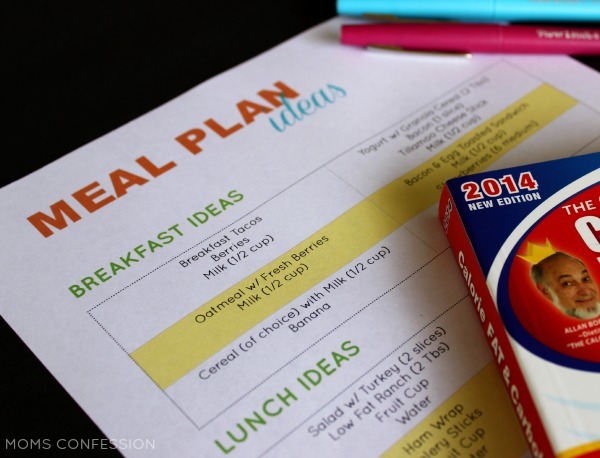 Make your meals ahead of time and list your meal ideas in plain sight. It was a lightbulb moment for me! Why didn’t I think of that? It’s such a simple concept! 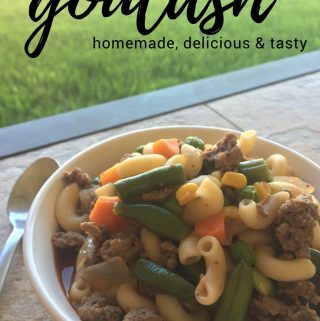 So over the past couple of months, my mom and I have worked together to come up with new meal ideas, combinations of meals that I can make ahead for breakfast and a guide for packing lunches and getting dinner on the table before 7pm. Get your free meal plan ideas printable here. I knew that with my crazy schedule and our mornings always running ragged that I would need quick healthy breakfast options that fit within a 300 calorie count so we could continue our journey to weight loss. One of my favorite recipes growing up was breakfast tacos, but I knew I had to find a way to get the calorie count down so it fit into our journey. Corn tortillas were the first change to my moms traditional breakfast tacos and the other change was to use a egg white substitute versus traditional eggs. The other day, my boys and I were home for a “snow/ice” day and we got crazy in the kitchen, even going as far as taping our very own cooking show for Wright Brand. Check it out! Don’t you think they did awesome? I do! Brown Wright Brands sausage patties in a medium sized pan as if you are cooking hamburger meat. Drain grease and rinse with hot water to remove any excess grease from the sausage. Add in egg white substitute and heat until eggs are completely cooked. Remove from heat and warm corn tortillas for approx. 20 seconds. Assemble! Add breakfast taco mixture (approx. 1 1/2 tablespoons) onto corn tortilla. Roll the tortilla up and wrap it into a piece of Saran Wrap. Freeze the breakfast sausages and enjoy them all week. When you pull them from the freezer, you can either heat them in the saran wrap or you can take them out of the wrapper and reheat them wrapped up in a paper towel. Heat for 15-30 seconds each. Top with salsa (freebie on calories), ketchup, cheese, or sautéd green peppers, onions and tomatoes. The topping options are endless!! 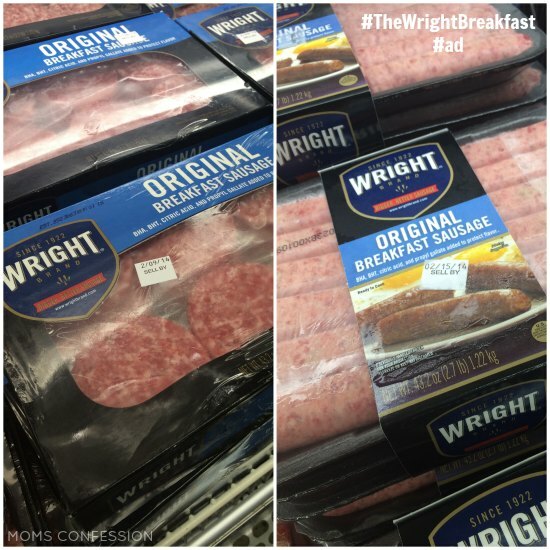 Wright Brand Sausage recently became available in Sam’s Club Stores. They are hosting demos of their brands product Feb. 6-7. I highly recommend you take a trip out and test their products. They are SO good. Pick up a pack for your family and let the kids help you make these Healthier For You Breakfast Tacos to pack in the freezer for a quick and healthy breakfast! 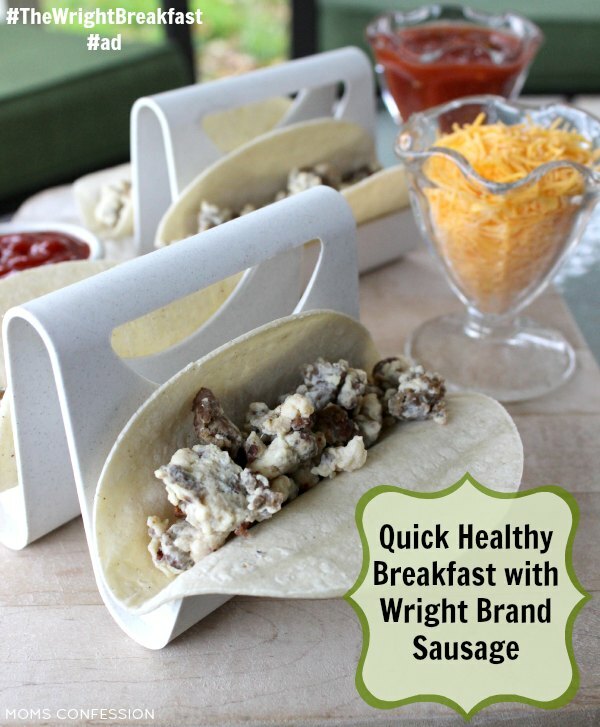 Be sure to follow Wright Brand on Facebook, Twitter (follow #TheWrightBreakfast and #CollectiveBias for more ideas), and Instagram….they are definitely sharing some yumminess you don’t want to miss out on. 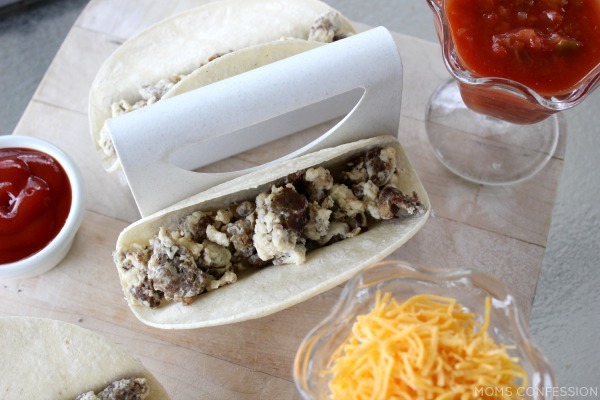 I love the idea of breakfast tacos! I am adding sausage to my grocery list so I can try these, they look perfect for a quick breakfast. Your boys did a great job! I love to see kids cooking in the kitchen. Breakfast tacos are a delicious breakfast idea and easy to make too. Yours looked great! Those breakfast tacos look amazing! I cant wait to try them. I really love your taco holder. I will definitely pick up a package of Wright Brand Sausage during my next trip to Sam’s Club. Those looks delicious! I’m more of a savory breakfast person so this is right up my alley! Thanks Kathy! Savory breakfasts are awesome, aren’t they? Oh my goodness those look so good! I love a good breakfast taco!